A brief history of Warwick and environs - Times Publishing Newspapers, Inc.
Why would a group of Scottish and Irish settlers name a township after a county town in a mid-England shire? That’s still anyone’s guess. 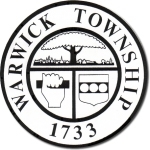 But what we do know is that the original 18 residents of Warwick Township officially petitioned for their own municipality on February 13th, 1733. Prior to that the area had a quasi-government called Middlebury, which stretched from present-day Court Street in Doylestown to Ivyland Borough. The territory would be cut in half when Doylestown Township was organized in 1819 and when other boundary lines changed. The family names of these Scottish Presbyterians included Jamison, Ramsey, Archibald, Wallace, McMicken, Henderson, and McCullough, most of whom later migrated to the frontier at Forks of the Delaware in present-day Northampton County. Around the early 18th century, the Neshaminy-Warwick Presbyterian Church formed near the township’s southeastern boundary by Little Neshaminy Creek. The Rev. William Tennent was soon after named pastor, and by 1726 he founded Log College to teach ancient languages and the Bible to those in the ministry. However, only Harvard or Yale graduates of that time could become Presbyterian ministers – excluding Log College graduates from the ministry. The exclusion led to new colleges like Log College’s successor the College of New Jersey, which got a new name in 1896 – Princeton University. Situated at the intersection of Old York and Almshouse roads, the village of Jamison got its name from the well-known Jamison family. The name itself derives from the Clan of Gunn, a fierce and warlike people of Norse heritage who inhabited the northeast coast of Scotland. The descendants of the family that migrated to Jamison were from Henry Jamison, an Irish immigrant who settled in Warwick around 1720. The village at the center of Warwick was known as Jamison Cross Roads before 1830, and later Jamison Corner until a post office was established in 1868. Straddling Warwick, Buckingham and Doylestown townships, the village dating back to the early 19th century has had many names. As far back as 1804, Furlong was referred to as Baretown, or Barville, most likely after the Beartown Inn. The name of the establishment later changed to the Green Tree Inn with a sign affixed to the building that resembled a brush. Residents ironically began calling the hamlet “The Bush,” and the name Green Tree was adopted until being changed to Bushington with the establishment of a post office in 1832. The postmaster at the time, John Foster, called for a new name. After consulting with John G. Randall, postmaster at the county seat in Doylestown, the word furlong came up in passing. “‘Furlong!’ There’s your name,” said Randall. The post office sanctioned the name, which remains today. The village on the border of Warwick and Warminster townships got its name from Col. William Hart, a Revolutionary War veteran and former landlord of a hotel in Plumsteadville. In the late 18th century he moved to Hartsville and established an inn known as The Sign of the Heart. Before the Revolution, the village was also known as Cross Road, Harts Cross Road and Warwick Cross Roads. By this time the village already secured its footnote in history. By August 1777, Gen. George Washington and 18,000 of his troops set up camp in the village along the Neshaminy. Washington established his headquarters at the Moland House, home to the historic park that stands today. It was here that Frenchman Marquis de Lafayette joined the Continental Army, providing tactical leadership while securing vital resources from France during the war. In the late 18th century, steamboat inventor John Fitch made his first model in a wheelwright shop near Hartsville before giving it a trial run on a small nearby stream.